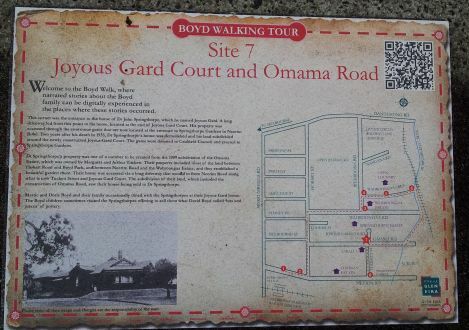 Last week I talked about the Glen Eira Storytelling Festival 2014 and mentioned the Walking Tour of Murrumbeena with a particular focus on one of our famous artistic families, the Boyds. I did this last Saturday, if you missed it there’s another one this coming Saturday starting at the same place and same time. It’s a great little walk with lots of history of the area and a focus on Merric Boyd. Merric Boyd was one of our foremost potters and has been named as the father of studio pottery in Australia. 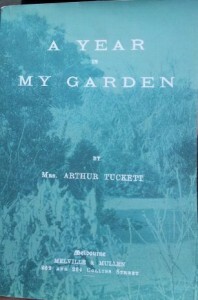 After attempting several different careers such as farming and religion Boyd successfully threw his first pot, at the age of 20 in 1908 he started a career. Story has it the first pot he threw on the wheel was perfect but if you’ve done any pottery you know how hard that is. I’ve done some and never managed to get anything right on the wheel. I won’t give you too much more as you can get much more than I’d give you by doing the walk on Saturday and listening to historian, Colin Smith. If that’s not possible, the council has made it feasible to do the walk by yourself with the magic of modern technolgy and have placed eight information sheets on the ground with a map and QR codes, all you need is a little time and a smart phone; they even give you a choice of either reading the information or listening to it. If you still can’t get there the other option is to go to this website and you can both see the text and hear the audio as they appear using the QR codes. 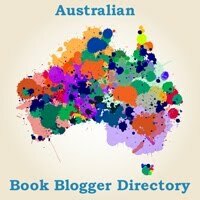 Here’s where I give you something pretty to look at. I’ve taken various photos as illustrations but I might give a little text to illustrate the illustrations (I really should try and get illustrate in that sentence a few more times to make it totally unintelligible except with intense photographs…I think I’ll move on before it gets even more silly). This is the plaque for Site 7, you can see the map and QR code on the right and a little information on the left. It’s attached to the pavement and is fairly obvious, I’d suggest they’ll last some time. Part of the history of the area includes Mrs Arthur Tuckett who had a fabulous garden, she detailed it over the space of a year and published a book in 1905. It’s not impossible to buy in the original but challenging. If you’re happy with an annotated reprint then I suggest going to Volkhard Wehner’s website and buying one there. This is the plaque for the gates which you’ll see momentarily. 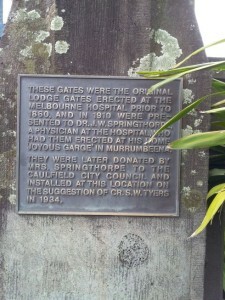 The plaque reads: These gates were the original lodge gates erected at the Melbourne Hospital prior to 1860, and in 1910 were presented to Dr. J. W. Springthorpe a physician at the hospital and who had them erected at his home ‘Joyous Garge’ in Murrumbeena. 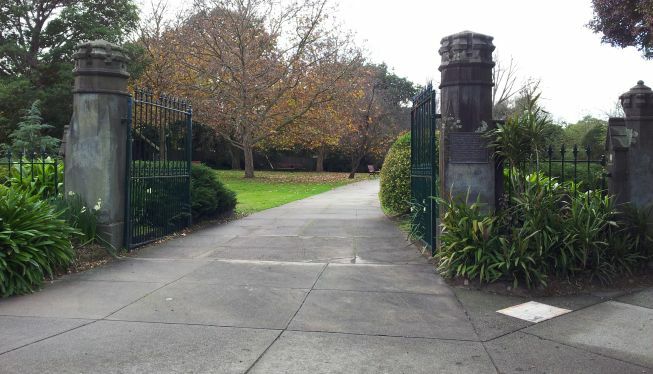 They were later donated by Mrs Springthorpe to the Caulfield City Council and installed at this location on the suggestion of Cr. S. W. Tyers in 1934. This is the gates. You probably can’t see as I’ve taken the photo carefully but they stand alone with almost no fence. If by chance someone cuts the chain and closes the gates you’ll have no problem with egress into Springthorpe Park. You can see the QR code plaque at the bottom right of the photo. After many interviews with local residents, Colin Smith put together this book. You can find it for sale for $50 at the newsagent in Murrumbeena. 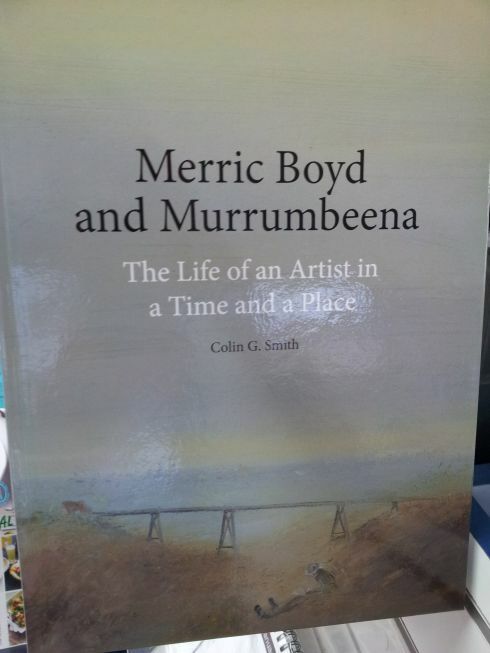 The same gentleman who served Merric Boyd and sold him many Spirax sketch pads will be able to sell you the book. It’s quite a hefty book and well worth the price. You might want to be quick, they’re selling well. 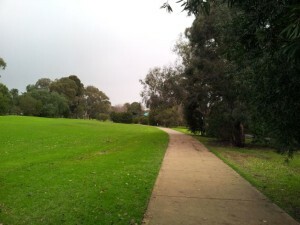 This is currently Boyd Park. If you have a good imagination you’ll be able to visualise the creek coming through on the right of the photo and the Outer Circle Railway Line coming through on the left. The Outer Circle Railway Line is a whole other story and would have been an excellent addition to our current train arrangements making it possible for people to travel to through some of the outer suburbs without having to travel into the CBD first. Most of it only lasted a few years, you can see the remnants on the Alamein line.